This is the final update on the work that began in October 2015. St Mary’s is now in the happy position of almost having completed the work on this phase of the Transformation project, with the installation last week of a splendid audio-visual system to replace the failing sound equipment, and adding a visual element that means we will now be able to benefit from a greater range of display facilities for various purposes. (The projection screen is as good as that of Wivenhoe Moving Image, who were kind enough to bring all their set-up to the church when we wanted to show the film Luther during the Reformation Anniversary last October). Clarity of sound has improved immensely through new speakers and the new loop system. The cunningly hidden projection screen means that the interior of the church looks no different. All that remains of this phase of the Transformation project is the installation of new lighting, which has been made possible with financial help of Friends of St Mary’s (FOSM). This is now in hand. The heating system is now operational. We had our first experience of it running on Sunday 9 October and a very good experience it was, too! Is this now the end of all the work at St Mary’s? Well, not quite, but the messy stuff is out of the way. It will be the turn of our audio-visual systems next: our temperamental audio really is in need of attention – the squeals and wails it emits on occasion cannot be properly controlled with the present set-up and the clarity of sound could be improved. At present there is no system as such for using visual aids and it makes sense to give thought to this element at the same time. All the radiators have now been fitted, six of them all around the church. We’re really grateful to the firm that fitted the system for working with us so well that all the seating was back in place for the big Harvest Service on 2 October. Some tidying and finishing will be happening this week and after that we’ll be cold no more! Lime plaster was being organised as the picture was taken and the project manager did not expect any delay to the work in consequence of this. Scaffolding was erected on 15 September, to reach the top of the chimney on the South side. The old chimney will be utilised as a conduit towards the outside for the new system. 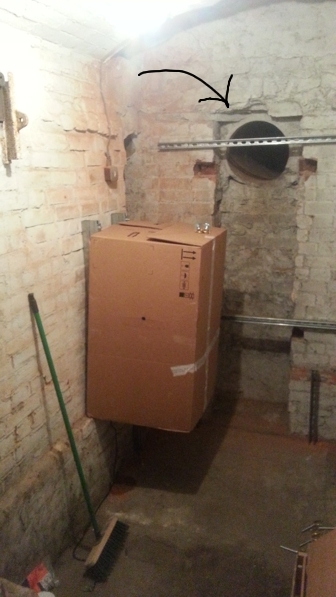 Work began a week ago to install the new heating system. 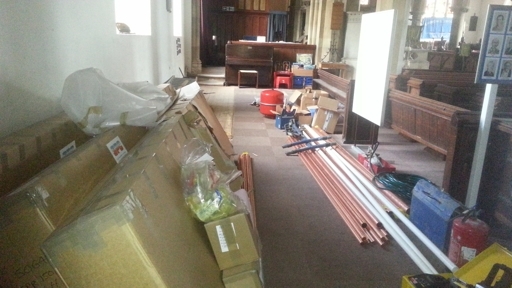 It meant that the North aisle had to be cleared to make space for all the materials and equipment. The new radiators are shown in their cardboard packing. Some runs of carpet tiles have been removed from across the front of the nave and along the South wall to give access to the underfloor space which is where some of the pipes will go. At the end of the first week, down in the boiler room the old boiler and connections had been removed and the new boiler fixed in position, though still in its protective wrapping. See the arrow in the picture, pointing to a hole in the wall? That actually leads into the duct that channeled hot air to the circular floor grill in the centre of the chancel. A few more pictures can be seen on the Snaps page. It will have been noticed that the scaffolding around the church recently disappeared and yes, the roof work and external stone masonry work that was planned is now finished! It’s a good feeling that the integrity of the roof has been restored and that threats to the fabric of the building from that direction have been dealt with. All the dust and grittiness inside the church was disposed of in last Saturday’s Spring clean. There are still plans for adjustments to the interior: the seating, heating, lighting and sound systems. So we’ll keep this page going for a while yet. This page was started in September 2015. Now, about 6 months later, we can look forward to the end of the works. The internal scaffolding was removed before the wedding on 9 April – it was a bit of a nail biter but it went in time! Interior painting is still to happen but can be done from ladders once the lime plaster has dried sufficiently. The outside scaffolding will stay up until the external roof work is completed which shouldn’t be long now. As with many best plans, the restoration time table has gone aglay. Maybe not surprisingly when you go digging beneath the surface of an old building, additional problems came to light after the slating was completed. A secret gutter (secret because it’s hidden from the outside, something not unusual in building practice at the time) was discovered to be blocked and causing water ingress into a renewed section of the roof. So some of the slates had to come off again to deal with this. The gutter was cleared of debris and bird nesting material and a temporary patch was made to some rotten lead so no water will leak in but that lead will now also need replacing. It was fortunate that it was discovered while the scaffolding was still up and before damage was done to the new plaster work. The unfortunate thing is that, contrary to the hopes we had, the internal scaffolding will still be in place this Easter and continue to reduce seating capacity. We’re steadily making progress. Taking down of the temporary roof will begin on Friday 19 February and is expected to take three days. Re-slating can then begin and the estimate is that this will be completed by 4 March. Plastering between the ceiling beams of the south aisle roof will start before the end of February. The stonemasons have been hard at work, fitting the blocks that were prepared off site and also replacing broken bits of the stone tracery of one of the west windows; you can see some of that on the video. Our expectations that slating might have started in the week just gone were unfortunately dashed when it appeared that some more wood needed to be installed first and, the building being what it is, of course it had to be specially machined up first. After the next architect’s meeting on 2 February we will have further details to report. There’s progress on the stone repair front: all the new stone blocks have arrived and the fitting process will soon begin. More pictures have been added to to photo page. 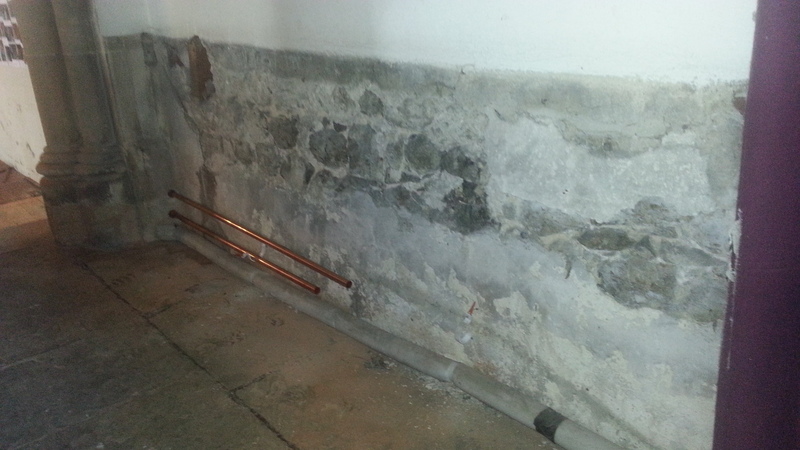 News was good: after the inspection, only a slight problem with just one of the wooden roof beams was found. More photos have been added to the photo page to show the work in progress. All roof tiles and old battens have now been taken off, new mesh has been installed in readiness for plastering and felting and battening will be completed asap. With the roof open, temperatures inside are much affected. This morning we put chairs in the chancel which is the area that is most effectively heated and there we’ll be huddling together on Sunday morning but hopefully not for many Sundays: the expectation is that the slater will be able to begin work in the week commencing 25 January! Work resumed this morning with Bakers of Danbury now on site. The south aisle roof has already been stripped of its tiles and the underlying layers are being removed so the wood can be inspected. Light was falling into the church from a new angle! As of this morning we are aware that a piece of hoarding came loose in the high winds and is noisily flapping. We apologise to neighbours for the incovenience and can inform you that the matter is currently receiving attention. The contractor’s representative is visiting this afternoon after a telephone alert and hopefully the situation will have been remedied before the day’s end. Some of the plastic screening around the upper levels of the scaffolding had come loose in the high winds recently. The contractors will be securing this and also double-wrap all sheeting to make it more robust. Additional hoarding will appear around the scaffolding poles on the north side of the church as well, to impede any access by the adventurous! We’re hoping that when work stops tomorrow, the community will help us by reporting anything untoward to 822511, 822548 or 824592. The scaffolding work took longer than the contractors expected – it was a big job! Now that it’s done, Bakers of Danbury have begun preparations for the ceiling repairs. They started by putting up more plastic sheeting around the sides of the platform underneath the ceiling, hoping to minimise the dust problems by enclosing the working area as much as possible. The plan is to start with the ceiling itself so that the roof can remain in place during the busy Christmas season. We have been fortunate with the weather so far but it’s nice to know that, even if that changes, we won’t be shivering inside just yet! Bakers will work until 18 December, when they will have a break and start back again in the week commencing 4 January. Scaffolding work should finish next Monday 16th November. At present,there is a wait for sheets to arrive – they’re going over the top beams that were the last to be erected to protect the roof space beneath. Once they are in place Baker’s can start on the real repair work. In the meantime the outside of the church presents the kind of picture you shouldn’t expect to see more than once in a lifetime. More scaffolding work will be done today, Monday. Unfortunately on Friday 7 November deliberate damage was done to the hoarding on the south side of the church. Wivenhoe Scaffolding Ltd responded very quickly to the report of damage and were able to send someone down on the same day to clear the footpath. If anyone comes across this sort of thing in future we’d be grateful for an alert by ‘phone to 822511, 822548 or 824592. We had a works meeting with the church architect this morning. The roof alarm was one of the items discussed. It is a relatively new feature and we are sorry that it has gone off a couple of times when it shouldn’t have, as a consequence of the ongoing scaffolding work. We’ll be contacting the alarm installers again to try and maximise the efficiency of its operation. The scaffolding work is supposed to be finished three weeks after it started. Eventually, it will span the church from north to south. Any hold-ups in progress are being followed up. Neighbours of St Mary’s may have noticed quite a bit of activity over the last week. Scaffolding has gone up on the South side of the church and also on the inside. Some very good pictures have been added to the photo page, they were taken by Adrian Multon on Saturday 31 October and you can access them via the yellow Photos circle on the Restoration page. Temporary alarms were today installed on the scaffolding by Cactus Security. We had found that without this, our insurance cover for damage to/theft from the roof would have been nil – despite there being a roof alarm already! Even so, we were told that cover for theft from the roof will be severely reduced while scaffolding is up. Churches are vulnerable buildings but hopefully, being in the centre of an alert and well-informed community will lessen the risk to St Mary’s. News just in: the scaffolders will arrive on Tuesday morning 27 October. The start of the work has been delayed by a week and is now expected to be in the week beginning 26 October. The reason: no scaffold designer was available. Apparently they’re thin on the ground and much in demand! We had a meeting with the contractors this morning and they confirmed that the works will start during the week beginning Monday 19 October. If everything goes according to plan the works should be finished mid-February.